Hello! 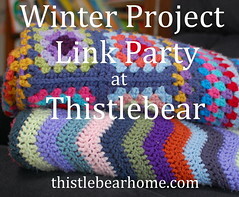 Welcome to December's Winter Project Link Party. 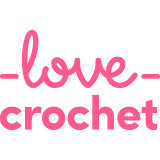 This link party is for sharing your current craft projects and giving and receiving encouragement for working on those projects and maybe even getting them finished. I hope you'll want to join me in sharing what you're working on right now! I finished the My Sweetiepie ABC's cross-stitch sampler and dropped it off at the framer's a couple of weeks ago. It's back home now, ready for Miss GB's Christmas (I'll share it here soon). I moved right on to another project when I finished the sampler. 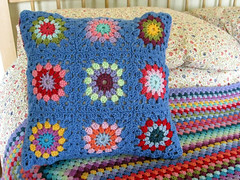 My current crafty pursuit involves these colorful crocheted butterflies. I'm almost done making them; I'd like to add two more solid-colored ones, a light pink and a dark pink. You're probably wondering what I plan to do with them...well, they will soon become a decoration for the GB's room. I plan to give it to her for Christmas, if I can finish it in time, so I've been working on it quite a bit lately. I'm not usually one for making rainbow-colored stuff, but I loved doing it with these butterflies. Aren't they pretty? 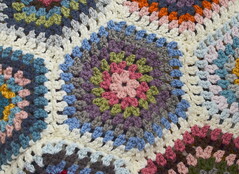 I'm using a pattern called Bountiful Butterflies, from crochet designer The Hat and I (that's a Ravelry link). I'll use the butterflies to make a hanging decoration, similar to what you see on the link. The butterflies will hang from beaded strands that are attached at the top to a ribbon-covered embroidery hoop. Fancy! It's actually pretty simple, but it's taken a little bit of guesswork to figure out. Let me backtrack a little: I first came across the idea on Pinterest, where I saw a photo of a finished decoration, which I just LOVED. Then I tracked it down to Ravelry and saw that there weren't formal instructions for the decoration, just the butterflies themselves, so I studied some of the project photos and came up with a plan for making my own decoration. It will hang from the ceiling, over the GB's bed. Fortuitously, there is already a plant hook in the ceiling exactly where I want it. It won't be exactly like the ones I saw online, more inspired by them. I've been thinking about this project for months, since July or so. I bought a few new colors of cotton yarns for the butterflies, to add some brighter colors to my mostly-pastel stash. I had fun choosing beads. I found these multicolored, faceted rondelle beads at Hobby Lobby. I'll use bright pink tulle strips to cover the filament strands where they attach to the hoop at the top. The ideas work in my head, but we'll see how they translate to the real thing. With any luck, I'll be sharing it here soon. This rainbow on my desk has really grown on me. It has also brought to mind just how full of rainbows my 80's childhood was. I've been remembering all the rainbow things I used to have! I had a stretchy Care Bears belt; a pair of Kangaroos sneakers with rainbows on the sides; a Strawberry Shortcake shirt with a rainbow strip running up one arm, across the chest and down the other arm; shoelaces, hair ribbons, plastic barrettes, a ski hat! Rainbows everywhere. Even the Bear had rainbow suspenders when was a little boy (I have photographic evidence). Love the colors can't wait to see it complete. I'm sure it will be wonderful and the GB will love it. I can't wait to see your cross stitch too, what a lucky girl your daughter is. Such pretty colours and I'm sure GB will love it. Looking forward to seeing the framed sampler too. I am sure GB will love both her gifts, made with love. I love the beautiful array of colour and looking forward to seeing the completed projects. Take care. so nice! I don't find that I have a lot of time for crafting right now, but one thing at a time! I did make it to quilt guild today! I would love to see your China (that you mentioned in a comment on my blog, thank you for that)... I bet it would be so pretty at Christmas time!! ... I get how our expectations for the future don't always happen; same here; but we can still create beauty and love those we are given! :) I LOVE the butterflies you made! rainbows are so lovely; I had the same thing growing up... rainbows are wonderful! The butterflies are so colourful! I'm sure GB will love the creation you come up with. I often use fishing line for hanging things in our crafts. It's strong and camouflages well. I followed your link, and can see why you were grabbed by that mobile. It's great that you at least have a pattern to follow for the butterflies themselves. I think this would be a great beading project for the whole family to work on over the holidays! Looking forward to seeing the framed sampler soon ;) Have a great weekend and thanks again for hosting Jennifer. Rainbows on clothes in the eighties, yes!! I know exactly what you mean. I'm rather partial to a rainbow or two myself. These butterflies are looking delightful and I can't wait to see how they turn out. Your GB is doing well for the handmade gifts this year! Hello Jennifer, I love this project. It is so much fun having a little girl when you are a crafter - it will be gorgeous, whichever way it turns out. What little girl would not love a circle of butterflies flying above her bed. Now you mention it, there were a lot of rainbows around back in the day. I made my small daughter a rainbow skirt, and we had a favourite story book about rainbows. I just checked the link to the hanging. It's going to be so pretty. I love the rainbow colours!